There was a lot of basketball over the weekend. That’s exciting! Now, let’s round it up before Wake Forest drops another game on its home floor. There are a lot of ways to marvel at the powers of Zion Williamson. We talk plenty about Duke’s ability to defend and induce opponent chaos — 13.9 percent steal rate, No. 1 in the nation — with Williamson, Tre Jones (back!) and Cameron Reddish flying around. In the win over Georgia Tech, Duke bagged another 13 steals (18.8 percent steal rate); this is the team’s 10th game with 10+ steals. Cam Reddish can’t hit a 3-pointer (his shot is out of wack), but he nabbed five steals; elsewhere, Williamson recorded three blocks and two steals. Zion is such a physical force; he now has 38 steals, 35 blocks and 42 dunks this season (78.4 FG% at the rim). Williamson is one of only two Division I players with 35+ blocks and 35+ steals so far this season. Currently averaging 21.7 points per game (69.5 eFG%), Williamson is on pace to be just the second ACC player since the 1992-93 season to average 20+ points with 35+ blocks and 35+ steals. The other: Maryland’s Joe Smith in 1994-95. And that’s the thing, Zion has already cleared those benchmarks for blocks and steals. This guy isn’t human. Ty Jerome was once again brilliant in Virginia’s road win at Notre Dame: 13 points, nine rebounds, six assists, one steal and no turnovers. The junior point guard is now up to 10.1 assists, 3.4 steals and just 3.2 turnovers per 100 possessions. His backcourt mate, Kyle Guy, is on a smoker right now, too. He’s made at least one 3-pointer in every game this season; Guy is now up to 46.7 percent shooting from beyond the arc in ACC play. According to Synergy Sports, he’s been deadly off the catch: 1.27 points per possession (62.8 eFG%). When it comes to using screens, Guy is the ACC’s kingpin. Guy has an effective shooting clip of 64.7 percent on off-screen attempts this season, per Synergy. He’s made 21-of-42 off-screen 3-point attempts. Outstanding. Also, De’Andre Hunter was very good, again. With Sterling Manley sidelined, Garrison Brooks continues to give North Carolina production at both ends of the floor. Brooks can defend the pick-and-roll, offers a little rim protection (1.1 blocks per 40 minutes) and can get in passing lanes. He offers no stretch and isn’t super explosive, but he does bring some post offense to the table — by finishing at the rim (73.8 FG%). Brooks averages 4.7 offensive rebounds per 40 minutes, and he scored 1.25 points per possession on put-backs after an offensive board, per Synergy. Garrison Brooks's dunk was his 14th of the season and 33rd of his career. He's now tied with Kennedy Meeks for the 20th-most dunks by a Carolina player in the Roy Williams era (Dexter Strickland is 19th with 35). Again: Continue to buy stock in Leaky Black. Leaky Black has been the perfect complementary piece in starter-heavy lineups this season. In 28 ACC minutes, UNC is an absurd +47 (73-26) with Leaky & 4 of the top 6 (starters + Little). With Leaky and 3 or fewer of the top 6, UNC is -38 in 30 ACC minutes. Even with a rough shooting performance from Nickeil Alexander-Walker (0-5 3PA), Virginia Tech looked whole against Syracuse. The zone offered little resistance against a Hokies squad that spread the floor and moved the ball with gusto: 1.21 points per possession, 14 3-pointers and 23 assists. The assist total is great; however, it tells only part of the story. Tech kept the ball pinging around the perimeter — constantly a step ahead of the zone. Virginia Tech assisted on 92 percent of its 25 field goals on Saturday night; that passing charge was led by Justin Robinson, who was exceptional. Robinson scored 35 points — without a 2-point field goal attempt (9-13 3PA) — and dished out eight assists. The lefty point guard becomes just the second player since the 2010-11 season to score 35+ points without attempts a field goal from inside the arc. Alexander-Walker struggled to score, but he did have eight assists. The Hokies used him liberally to attack Syracuse’s zone from the middle, and work inside-out or inside-baseline cut. After Saturday’s home win over Pitt, Louisville is now 6-1 in ACC play — winners of five straight. Under Chris Mack, the Cards have been excellent; Louisville has won five league games by 10+ points. Currently, the have a conference game point differential of +95, which is excellent. Even when Louisville struggles offensively, which it did in the rematch against Pitt (0.97 points per possession, the lowest since the Kentucky loss), it can win with defense. Louisville’s now up to 37th nationally in weight defensive efficiency, per KenPom, even though this team doesn’t force many turnovers (18.3 percent opponent turnover rate). Against Pitt, though, Malik Williams, who continues to show some skills as a stretch-5 with some rim protection, blocked three shots. The invariably-active Dwayne Sutton grabbed three steals, too. It was far from pretty (22.1 percent turnover rate), but in Markell Johnson’s return to the lineup, NC State pulled out an epic victory — thanks to the heroics of Braxton Beverly. According to KenPom, NC State had a one percent chance of winning this game in the final seconds; however, four straight missed free throws from Marcquise Reed (83.4 FT% for his career) opened the door. With a second to play, Beverly ripped it off its hinges. As I noted above, Syracuse’s zone was toasted by Virginia Tech. From a defensive efficiency standpoint — 1.21 points per possession, 66.7 eFG% — this was the worst game of the season so far for Syracuse. The Orange blocked only two shots as the Hokies zipped the ball around the perimeter. For all of you panicked Syracuse fans who emailed me, texted me, tweeted at me after the Orange lost at Virginia Tech. Last week was beneficial timeframe for Florida State. Wins over Clemson and Miami won’t exactly set the world on fire, but in both of those games FSU scored over 1.1 point per possession and defended pretty well. After losing three straight and four out of its last five games, two straight ACC wins — including one on the road over a rival — has to feel nice. Florida State has already used 10 players tonight. Leonard Hamilton just now, subbing five fresh bodies in. That's what Miami and its seven-man rotation is dealing with. Sophomore wing MJ Walker has struggled with his shot and turnovers (4.3 per 100 possessions) this season; in ACC games, he still has an effective shooting rate under 42 percent. However, he snapped out of his slump in a big way at Miami: 22 points (two off tying a career high), a career-best six 3-pointers, five assists and only one turnover. This may have been his finest game in an FSU uniform. This must be an incredibly frustrating season, so far, for Brad Brownell and Clemson. This isn’t a bad basketball team; there’s talent on the roster. But after Saturday’s last-second collapse in Raleigh, Clemson fell to 1-5 in the ACC following two more road losses. After three straight top-offenses for Brownell at Clemson, this year’s bunch has sputtered. The Tigers are scoring just 0.89 points per possession (46.6 eFG%) on spot-ups this season, according to Synergy. That’s down from 0.99 points per possession (50.8 eFG%) last season. Shelton Mitchell, especially, has struggled (40.3 eFG%) on spot-up attempts. As its offense has struggled — three straight games well under one point per possession — Pitt has come back to Earth after a 12-5 (2-2 ACC) start — with three straight losses. Still, there’s so much to like with what Jeff Capel is doing here. Freshmen Xavier Johnson, Trey McGowens and Au’Diese Tony have slumped during this losing slide; however, this is the backbone of what Capel’s building at Pitt. Good stuff is set to come; in the meantime, this team will compete (No. 20 in adjusted defensive efficiency) and give no opponent a night off in the ACC. This team continues to fight, which has to be encouraging for Josh Pastner. Less encouraging, though: Georgia Tech still can’t score. At Duke on Saturday, Tech held a second-half lead; however, the Yellow Jackets managed to score under 0.77 points per possession. That marks the fourth game this season that Tech has scored under 0.8 point per possession — with three of those games coming against ACC opponents. This is just a BRUTAL back-to-back for Notre Dame. In the span of 48 hours, Mike Brey’s undermanned club gets to play Virginia and then Duke — No. 1 and No. 2 in KenPom, respectively. Duke has struggled this season against zone defenses: 0.84 points per possession (45.8 eFG%). The Blue Devils — outside of Zion — had issues against Georgia Tech’s zone on Saturday. Can Notre Dame duplicate that effort on Monday? Also, John Mooney has been pretty awesome: 14.5 points (57.4 eFG%), 10.8 rebounds (29.8 percent defensive rebound rate) and 45.5 percent shooting from beyond the arc. Since his return to the lineup, power forward Steffon Mitchell continues to do nice things for Boston College. Mitchell has played 24+ minutes in each of the last three games, including wins over FSU and Wake Forest. Jim Christian told the team at halftime "we're going to come back and win this game. We practiced too well to lose this game"
Mitchell doesn’t score much (6.8 points per 40 minutes, 12.4 percent usage rate); however, he rebounds (10.7 boards per 40 minutes), blocks shots (8.6 percent block rate in ACC play) and avoids mistakes. 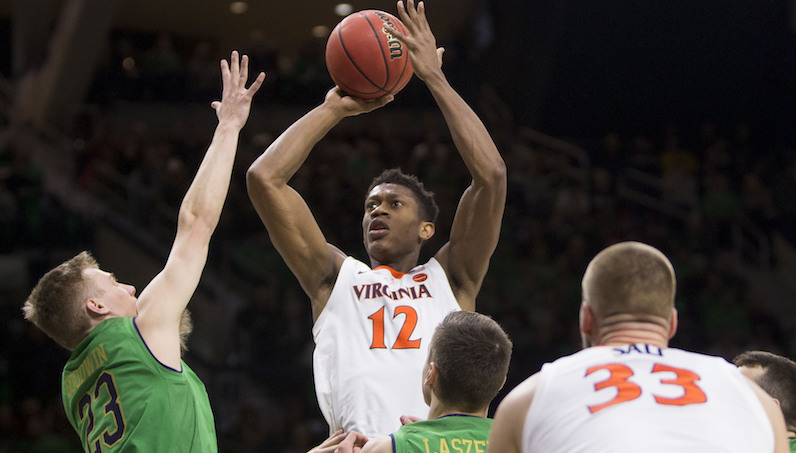 In 106 minutes of ACC action, the sophomore forward has yet to record a turnover. It’s hard not to feel a little bit for this team. Chris Lykes is a dynamic pick-and-roll point guard (0.99 points per possession, 55.5 eFG%), and Anthony Lawrence is solid second-side offensive player — 1.67 points per possession on pick-and-pops, per Synergy. Miami has some really good pieces; it’s just not enough to offset NBA departures — Lonnie Walker, Bruce Brown — and the absence of Dewan Hernandez. Speaking of which, hey, more bad news from the NCAA! Thanks, guys! Yeah, man, I dunno. It just keeps getting worse in Winston-Salem, and it feels like the situation with Danny Manning has become untenable. It feels like we say this — or something similar — every week, too. Brandon Childress has been really great offensively; somewhere inside of Jaylen Hoard there’s an NBA future. Other than that, this team has struggled in basically every aspect. As usual, it’s a nightmare on defense. Wake Forest 198th nationally in adjusted defensive efficiency; opponent are scoring over 1.25 points per possession (60 FG%) at the rim. And after the home loss to Boston College, when Wake managed to score just 0.95 points per possession, the Demon Deacons are 8-11 (1-6 ACC) and have a -81 point differential in seven league games. More good news: The buzzsaw that is Louisville basketball — 14th nationally in adjusted offensive efficiency — comes to town on Wednesday, too. Honestly, if you’re a Wake fan and still reading this, might I suggest to you this video of dogs doing funny things.